Life changes, and we are here to help. We offer unique and more affordable Estate Sale, Business Liquidation and Moving Sale Services. Our patent pending process takes advantage of modern technology that provides for a superior service that is unmatched. We can significantly limit the impact to your property, as well as the number of people going through your possessions, while exposing the items to more buyers. We utilize a large, local buying community and online competitive bidding for results that are better than traditional Estate Sales. Every single item is inventoried and appraised. A detailed report is available after the sale is complete. On top of the lowest commissions, there is never any theft loss, security is our top priority. Gated and Restricted communities are not a problem with our system. Everything is out when we are done, and the home is ready to be prepped for sale. We are flexible to YOUR family’s needs, from multiple sales, to working while someone still lives in the home, to handling unique and un-usual items or projects. Frankly we have 2-6 sales EVERY week and have no were near enough buyers. 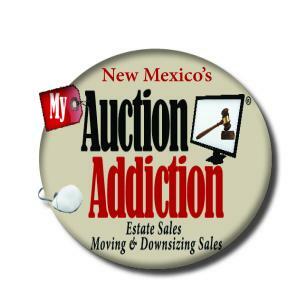 Check out some of the photos of items we or are coming up and give New Mexicos best kept Estate Buying secret a try. Fantastic High End moving sale with Stickley furniture, rustic SW pieces, rugs and way more! Moving to Mexico Estate Sale! This company has posted a total of 52 estate sales. Only the most recent 50 sales are shown. Just a note to thank you for selling my stuff. If I think of anyone who may need your services I will pass along your number. Thanks again and best of luck growing your business.